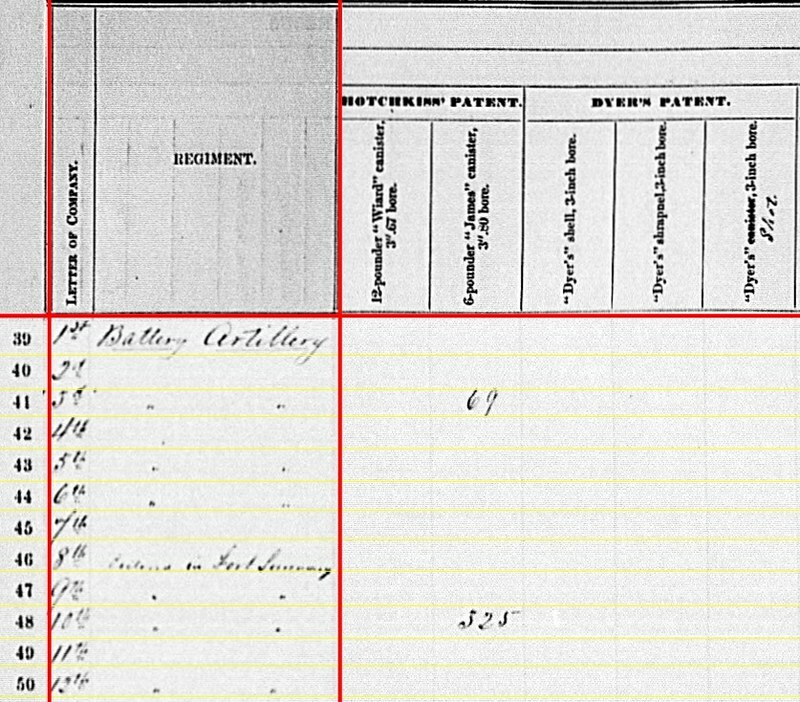 In our journey through the Summary Statements, we’ve arrived at the third quarter of 1863. Readers well know the chronology of events for July, August, and September. In some theaters, particularly the Eastern Theater and Trans-Mississippi, armies awaited the signal to resume campaigns. In places such as Northern Georgia and the South Carolina coast, hard campaigning proceeded. So we have the task of projecting the data into that time line, looking to correlate reports about cannon and shells to the actions. For the quarter, there are a few changes to column headers. Clearly the clerks in the Ordnance Department were adjusting to new “paradigms” with respect to ammunition usage. But, ever watchful of the government’s expenditures, they opted to modify existing forms. 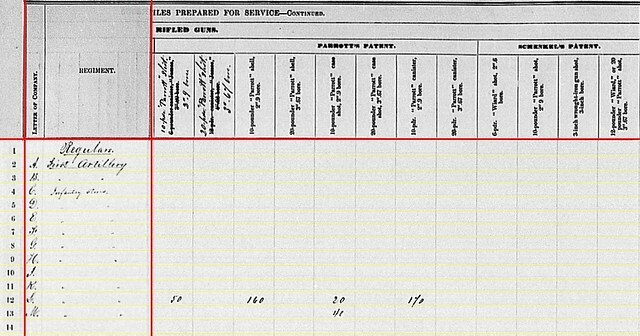 Battery A – Reporting at New Orleans, Louisiana with two (down from four) 12-pdr Napoleons and two 3-inch rifles. Captain Edmund C. Bainbridge remained in command of this battery, and also served as division artillery chief. Battery was assigned to First Division, Nineteenth Corps. Bainbridge, who was actually a 5th Artillery officer, was reassigned to duty in Tennessee in October. 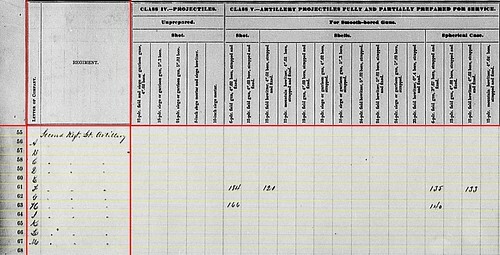 Battery B – Reported on Morris Island, South Carolina with four 12-pdr field howitzers, and adding two 3-inch rifles. Battery B was assigned to Tenth Corps, Department of the South. By late September, the battery had moved to Folly Island. Lieutenant Guy V. Henry held command of this battery. But after a short detail as the Department’s Chief of Artillery, Henry transferred to command the 40th Massachusetts Infantry. Henry’s designated replacement was Captain Samuel Elder. However, that officer would not arrive until later in the fall. 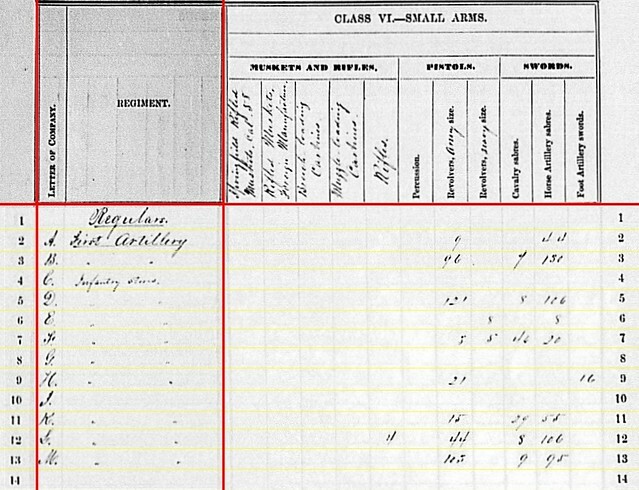 Lieutenant Theodore K. Gibbs was ranking officer in the battery through the transition. Battery C – At Fort Macon, North Carolina and serving as infantry. Lieutenant Cornelius Hook held command of the battery, assigned to the Department of North Carolina. However, a detachment from Battery C, under Lieutenant James E. Wilson moved to South Carolina and served in the Tenth Corps. They would man Battery Stevens during the First Major Bombardment of Fort Sumter. Sergeant Michael Leahy, in that detachment, later received a commission and served in Battery B. Battery D – Located at Beaufort, South Carolina with four 3-inch rifles. Lieutenant John S. Gibbs commanded the battery, assigned to General Saxton’s Division on Port Royal Island. 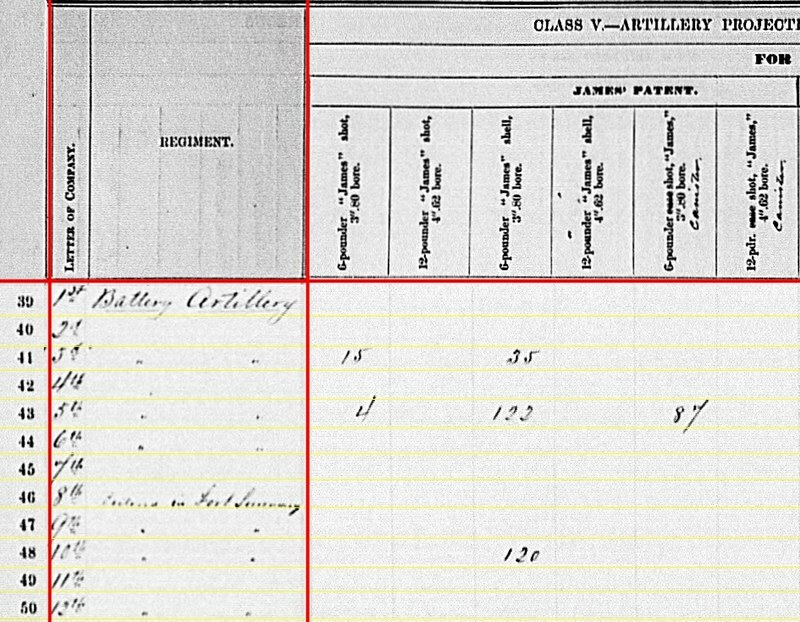 Battery E – Reporting at Centreville, Virginia with four 3-inch rifles. With Captain Alanson Randol moved to command the 1st Regular Brigade, Artillery Reserve, Army of the Potomac, Lieutenant Egbert W. Olcott had command. The battery was assigned to 2nd Brigade of Horse Artillery, Army of the Potomac. Battery F – At Camp Bisland, Bayou Teche, Louisiana with four (down from six) 12-pdr Napoleons. Captain Richard C. Duryea commanded. This battery served Third Division, Nineteenth Corps. 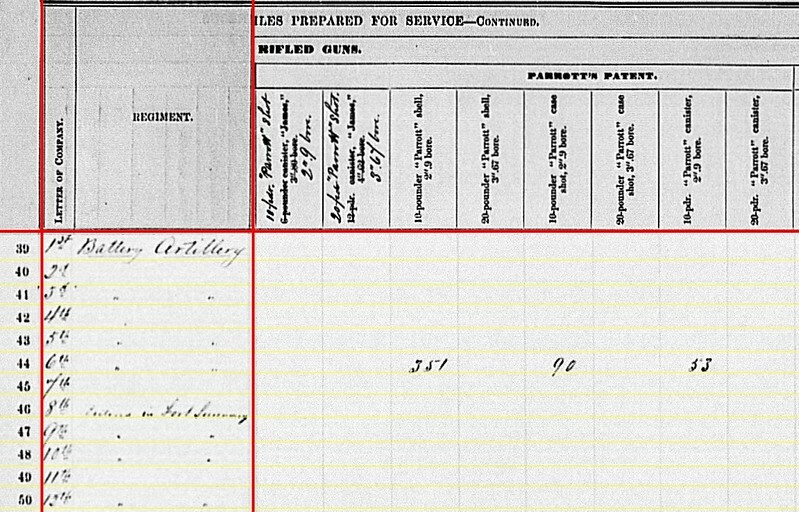 Duryea is also listed as commanding the division’s artillery at this time. Lieutenant Hurdman P. Norris was the next ranking officer in the battery. Battery G – No report. Dyer’s has Battery G’s personnel serving with Battery E at this time. Battery H – Reporting at Culpeper, Virginia with four (down from six) 12-pdr Napoleons. The battery remained under Lieutenant Philip D. Mason, in First Brigade, Artillery Reserve. Battery I – No return. But we are familiar with Lieutenant Frank S. French replaced Lieutenant George Woodruff, mortally wounded at Gettysburg, in command of this battery. I believe they were reduced to four 12-pdr Napoleons, as they supported Second Corps, Army of the Potomac. 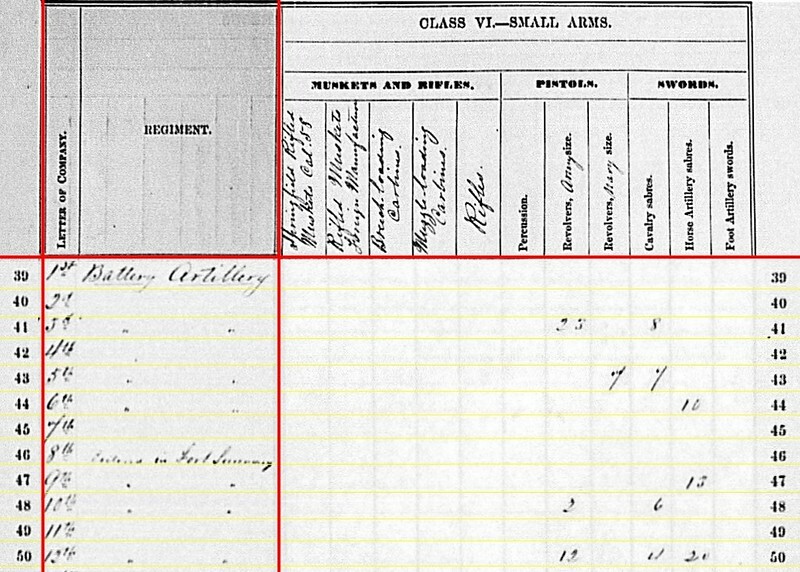 Battery K – Reporting at Warrenton, Virginia with six 3-inch Ordnance Rifles. Battery assigned to Second Brigade, Horse Artillery. With Captain William Graham in command of that brigade, Lieutenant John Egan was senior officer. Battery L – Reporting at a plantation, which is illegible to me, in Louisiana with four 12-pdr Napoleons and two 10-pdr Parrotts. Captain Frank E. Taylor replaced the Henry W. Closson, who’d been brevetted to Major. After Port Hudson, the battery transferred to the Nineteenth Corps’ artillery reserve. Battery M – At Beaufort, South Carolina with four 12-pdr Napoleons. Captain Loomis L. Langdon lead this battery, assigned to the Tenth Corps. Battery A: 15 shot, 34 shell, 10 case, and 12 canister for 12-pdr Napoleons. Battery B: 240 shell, 280 case, and 112 canister for 12-pdr field howitzers. Battery F: 144 shot, 48 shell, 144 case, and 54 canister for 12-pdr Napoleons. Battery H: 188 shot, 68 shell, 192 case, and 64 canister for 12-pdr Napoleons. Battery L: 106 shot, 38 shell, 182 case, and 40 canister for 12-pdr Napoleons. Battery M: 466 shot, 111 shell, 469 case, and 88 canister for 12-pdr Napoleons. I’ve learned, through long reviews of the summaries, not to reach too far with speculations about the quantities of ammunition reported. But we see the number of rounds for Battery A’s two Napoleons is but one chest. On the other hand, Battery M had plenty. Battery A: 12 canister and 202 percussion shell for 3-inch rifles. Battery B: 106 canister, 396 percussion shell, 160 fuse shell, and 155 bullet shell for 3-inch rifles. Battery D: 46 canister, 110 percussion shell, 85 fuse shell, and 158 bullet shell for 3-inch rifles. Battery E: 60 canister, 90 percussion shell, and 340 bullet shell for 3-inch rifles. Battery K: 72 canister, 311 percussion shell, and 300 bullet shell for 3-inch rifles. Battery M: 12 canister, 12 percussion shell, 24 fuse shell, and 20 bullet shell for 3-inch rifles. We see again Battery A was in short supply. But the 3-inch rounds with Battery M, which had only Napoleons, stand out. Battery M had a pair of Ordnance Rifles earlier in the year. Couldn’t Battery M simply did not transfer this meager quantity of Hotchkiss rounds to Battery D (located on the other side of Beaufort)? Probably some paperwork issue…. 10-pdr Parrott Shot, 2.9 inch bore. 20-pdr Parrott Shot 3.64 inch bore. These replaced columns for James canister in calibers 3.80-inch and 4.62-inch, respectively. We see the two columns to the left of those have hand written “canister,” but with no strike through of case shot. These changes reflected the disfavor and declining use of James projectiles by the mid-point of the war. Battery L: 50 shot, 160 shell, 20 case, and 170 canister for 10-pdr Parrott. Battery M: 40 case for 10-pdr Parrott. Again, we see Battery M with rifled projectiles on hand. 6-pounder “Wiard” case, 2.6-inch bore. 10-pdr “Parrott” case, 2.9-inch bore. 12-pdr “Wiard” or 20-pdr “Parrott” Case, 3.67-inch bore. 6-pdr bronze rifled case, 3.67-inch bore. 6-pdr “James” case, 3.80-inch bore. These all replaced canister columns for their respective calibers. This, I would submit, reflected the greater utility and use of case, vice canister. At least for the bean counters in Washington, that is! Battery E: 92 shell for 3-inch rifles. Battery K: 144 shell for 3-inch rifles. Battery A: Nine Army revolvers and forty-four horse artillery sabers. Battery B: Ninty-six Army revolvers, nine cavalry sabers, and 130 horse artillery sabers! Battery D: 121 Army revolvers, eight cavalry sabers, and 106 horse artillery sabers. Battery E: Eight Navy revolvers and eight horse artillery sabers. Battery F: Three Army revolvers, five Navy revolvers, forty cavalry sabers, and twenty horse artillery sabers. Battery H: Twenty-one Army revolvers and sixteen foot artillery swords. Battery K: Fifteen Army revolvers, twenty-nine cavalry sabers, and fifty-five horse artillery sabers. Battery L: Four rifles (type not specified), forty-four Army revolvers, eight cavalry sabers, and 106 horse artillery sabers. Battery M: 103 Army revolvers, nine cavalry sabers, and ninety-five horse artillery sabers. 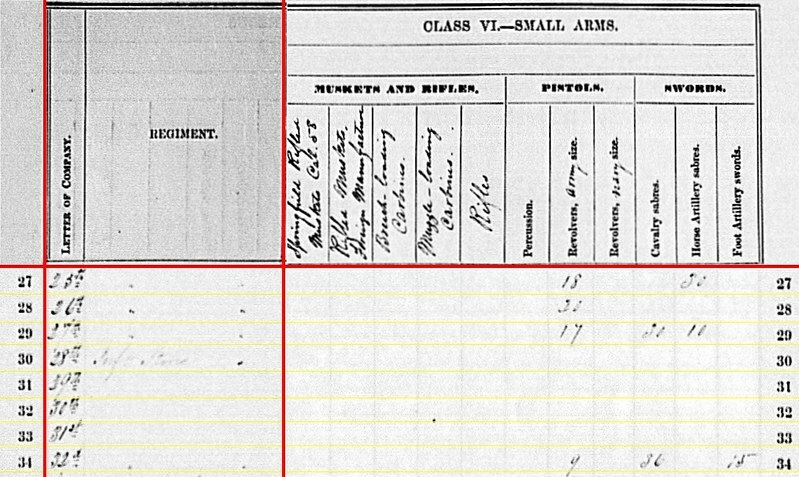 In previous returns, the batteries in South Carolina and Louisiana reported a substantial quantity of small arms. And this could be explained by the additional duties taken on by artillerymen in those locations – patrolling and garrison duties. 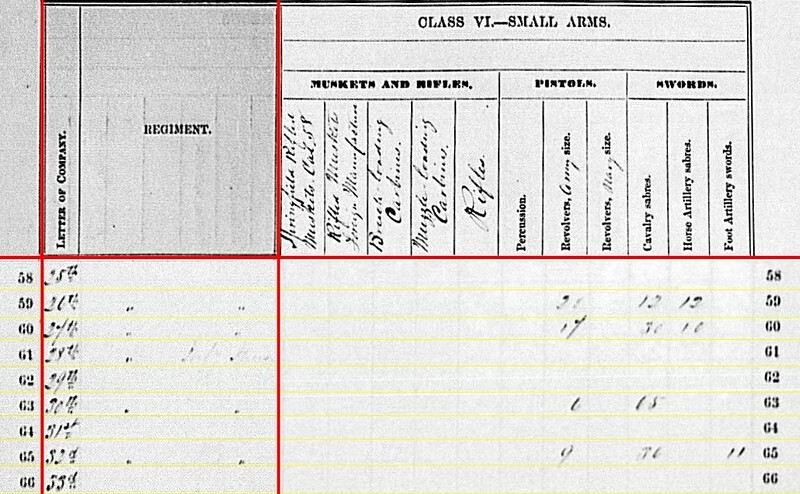 Though I would point out, Battery M turned in 77 Springfield rifles reported in June. 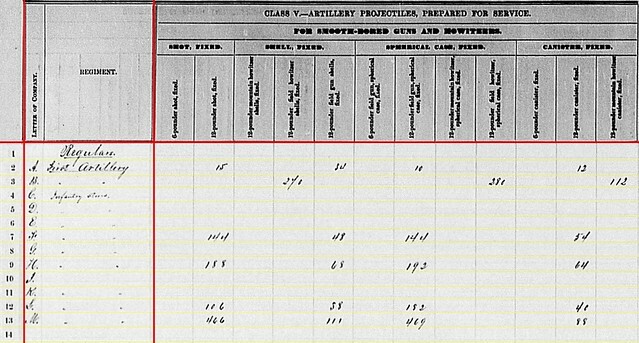 We’ll look at the 2nd US Artillery next.